How to create an internal company store to take back control of your brand and realize savings on your promotional product spend. Having easy access to promotional products is important for companies for many reasons. By bulk ordering a variety of products for events like trade shows or conferences, you are ensuring brand consistency while providing your brand with strong exposure that cannot be overlooked. In this age of technology, it only makes sense for a business to invest in a company stores to maintain their competitive edge, streamline internal ordering processes, and spark employee engagement. In the old days, a company store was primarily used by businesses in rural areas in which the stores sold everything you might need because there were simply no other options. In the 21st century, company stores have taken on an entirely different form. Today, they exist primarily as a online ecommerce platform for employees (and, sometimes to directly engage a company’s customer base) to get a little swag with their favorite company’s logo on it. This is a very basic definition of a company store as there are certainly many more intricacies involved with an online company store for employees. This guide will give you everything you need to know about building a robust company store that is customized to your specific needs. Before we go any further, it is important to have an in-depth discussion about company stores. Online company stores are essentially a one-stop-shop for employees to promotional products. The best part is that these marketplaces are run by third-party operators (in this case, iPromo), leaving the logistics of the platform out of your hands. All you have to do is work with a representative to design the store, choose the inventory, and direct your employees to the site. How Are Online Company Stores Used? CORPORATE USE: Corporate stores make ordering for trade shows, conferences, and other corporate events a breeze! No longer do your employees have to spend time out of their day trying to find someone to produce the items that they need for the upcoming events, and worry about quality concerns while maintaining brand consistency. Instead they can visit the company store for a list of approved items and artwork designs and place an order knowing that the items will represent your brand in the best possible light. PERSONAL USE: Employees may purchase a variety of items for personal use. Apparel items, like polos, jackets, hats, and sweatshirts, are commonly purchased at company stores to be worn both inside and outside the office. Any apparel purchase that is not part of an employee uniform can safely be categorized under “personal use.” There are also plenty of other items that can be found on company stores that employees will love so much they want to use them outside of the office too! FUNCTIONAL USE: Promotional items that fall under the “functional use” banner include any stationery like pens, pencils, and notebooks. It is imperative that day to day items maintain consistent branding as these are the items that are most likely to get into a client’s hands. Having branded pens with your logos is the easiest way to expose a new client to your brand. Rather than needing an internal employee to manage office items needs, now any employee can order the items needed for meetings, events, and general day to day needs. INCENTIVE PROGRAMS: Another reason employees might use a company store is to redeem points from an incentive program. Many companies offer incentive or safety programs which offer a variety of points that can be redeemed at the company store. If your company runs such a program, then your employees can simply use the website to order whichever items they would like. In some cases, company stores can also be used by consumers in the general public. Whether non-employee consumers use your company store or not is generally dependent on the format of the store and the popularity of your brand. For instance, a company like Coca-Cola might benefit from having an internal employee store while also having a consumer facing company store for their general consumer base to purchase items directly. In some cases, employee family members may want to order items from a company store to show their support. Of course, company stores are often employee-only propositions. But, that doesn’t mean that some of the items purchased there won’t make it to the general public. 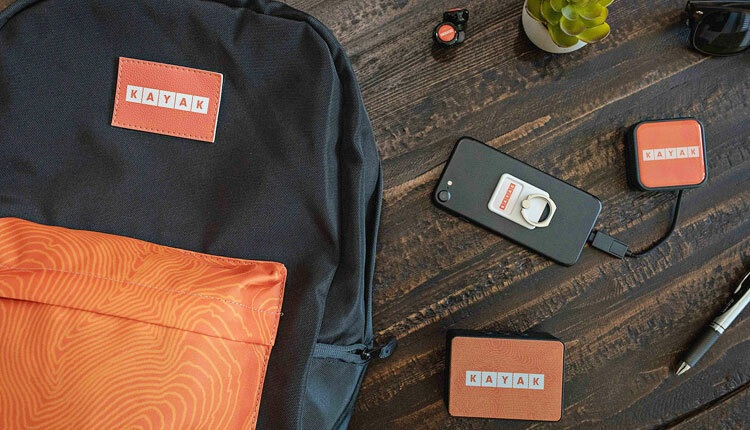 When it comes to ordering online swag, company stores are your best bet. But, how exactly do they work? We know that company stores are run by a third party (in this case, iPromo). In that case, what goes on behind the scenes to ensure that your company store runs smoothly? For starters, iPromo uses an ecommerce platform that makes the process as easy and pain-free as possible. Our platform is a comprhensive ecommerce software package that allows you to customize your online storefront, accept credit and debit card payments, create an inventory, and track orders in one convenient location. It also provides a few insights on which products get ordered more than others. Clearly, an online company store makes things exceedingly easy for you. But, who decides what promotional products make it into the inventory in your personalized store? The easy answer, of course, is you and your company. You decide exactly which products will be stocked in the store along with the design or designs that they will feature. marketplace at all times. iPromo also works with their clients to ensure that the products at their company store will be the most effective. As you can see, company stores are easier to set up than ever before. But what other benefits do they provide? If you need to order promotional products frequently, then a company store can make things a lot easier. But, what are the specific ways in which company stores provide ease and convenience? We know that a company store set up by iPromo gives you an ecommerce platform that can be accessed by employees across an entire company. We also know that iPromo handles a lot of the logistical hassles that you would otherwise cause you problems. Let’s discuss these and other benefits with a little more depth. Again, we cannot reiterate enough how easy company stores make things for companies. But, what are the alternatives? For the most part, if you want branded products, you would go to a site like iPromo and purchase those products. Each campaign would have an employee at your company working with a specialist at iPromo to come up with product types, designs, product amounts, and other logistical concerns. As a company grows, however, the number of employees, departments, and locations will also inevitably grow. Different locations may need to come up with their own promotional product campaigns independent of the larger corporate structure. Over time, the administrative costs of ordering the promotional products can start to add up. This is because each location will have their own independent dealings with the vendor. Each transaction will naturally have costs associated with design creation or general consultation that just wouldn’t be there with a company store. Why wouldn’t those administrative costs crop up with company stores? Quite simply, a company store is filled with pre-approved items that are ready to go whenever an employee wants to order them. In fact, a study by Forrester Reach estimated that instituting ecommerce solutions like a company store can reduce order management costs by as much as 90%. Thus, the only costs you incur are associated with the creation, maintenance, and functioning of the company store. Each individual transaction will not take on any added costs, allowing your employees to order items at their convenience. It limits any required oversight on your end, because you already know which products are approved. A huge benefit of company stores is the ability to ensure brand consistency across all products. When companies start to grow, various departments and locations may lose a sense of branding unity with promotional products. You obviously want all the promotional items that feature your logo or branding to be consistent no matter where the products are ordered from. We have all seen knock-off items that poorly mimic another company’s intellectual property. You don’t want any of your promotional items to come out looking like that. But, this kind of thing can happen if there isn’t a centralized marketplace like a company store. If one employee makes a bulk order for t-shirts but uses an old logo or website, then that batch of t-shirts will be out of line with branding and a poor representation of your company logo. Company stores, however, keep corporate branding consistent reducing potentially costly errors. Even if your company has a branch 2,000 miles away from your headquarters, you will still be able to maintain consistent branding because every branch will have access to the same store. By having an approved online catalog in your company store, companies are able to avoid the issue of an employee bulk ordering a product that you don’t want associated with your brand. For instance, if you don’t want your employees to purchase promotional golf balls, then simply leave them out of the inventory of your company store. It’s that easy to ensure that your corporate branding isn’t compromised by an individual employee. Just because all of your products have consistent banding does not mean that they can’t be diverse and unique. You can decide exactly what and how many products to feature on your company merch store. At iPromo, you can literally choose between thousands of different items and item types to feature on your online marketplace. Additionally, you can even have different logo designs for similar items. It’s always a good idea to have a little variety and give your employees a few choices. For example, you can have custom water bottles that feature a traditional logo and a separate bottle that might commemorate an anniversary of the company. You can even stock items with different color schemes or any other special designs you can think up. The fact remains that you will never run out of promotional products. You can also continually keep updating the inventory to ensure that you have the most effective and useful items available. Any new products that make their way to iPromo can be placed in your store’s catalog so that you will never be behind on the trends. It is not uncommon for companies to have regular orders of certain items. Pens are an exceedingly common promotional item that many companies order in bulk for trade shows or conferences. With an online company store for employees, you can order those pens with relative ease. This is largely because iPromo can process the order much quicker if they have pre-approved designs. If you order items on a regular basis, it is also easy to process and distribute reorders. You can literally get an order of pens or any other item with just a few clicks of a button. Because of this, promotional products end up in your employees’ hands faster than they would have under traditional ordering methods. They also end up in clients’ hands quicker, as well, ensuring that you get a good return on your investment. iPromo’s online marketplace is known for its user friendliness, and there is no doubt that you will be able to easily submit orders and get your products with no trouble at all. All this information can help you make informed decisions about which items to include, keep, or remove from your online marketplace. This also helps ensure that there are corporate-wide best practices for which products are moved more efficiently and provide the most return on your investment. No longer will you have to worry about low-performing products being purchased by your employees. Of course, these insights also help keep costs down by ensuring that your employees don’t ever purchase under-performing items. Company stores can also be used as a way to reward your employees. This usually occurs when certain employees take part in incentive programs. A company store provides them with an easy way to cash in their reward points to receive those incentives. These products obviously provide a much greater incentive to employees to work harder and complete programs. Of course, any of the other standard items will also be available to employees who might want to opt for that. What Products are Available for Company Stores? As we’ve mentioned above, every one of the thousands of products that are currently available on iPromo can make their way to your custom company store. Obviously, you don’t want every single iPromo item in your company store, but you definitely have options. iPromo will work with you to find the best items for your business. It’s also important to mention that iPromo features many prominent brands, ensuring the highest quality for your promotional products. Let’s take a look at a few categories of products that you might want to include in your company store. You can really run the gamut of all clothing items and accessories. On top of that, quality products will get used. That is just a fact. So, you never have to worry about these clothing items being thrown away or getting lost in the back of the closet. Of course, there are many other practical and useful items that you can put in your company store. You can even put items in their like pens that you actually need to replace at the office. There’s no shortage of products that provide functional appeal. You can also always stock your company store with a few fun items which are used more for entertainment than any actual pragmatic purpose. Some of them may be functional, but they aren’t particularly necessary. Again, the entire inventory of your company store is entirely up to you. If you want to make the items on their purely functional, then you can do so. In the end, it’s clear that company stores can do a lot of good for your company. If you’re interested in setting one up for your business, contact iPromo today!